Event Log Explorer 4.2 Free Download - Easy in use utility for effective Windows event log analysis. Download it free. Easy in use utility for effective Windows event log analysis. Download it free. Event log analysis of Windows event logs is a vital task for any system administrator. The standard Windows Event Log Viewer has limited facilities, and doesn't allow you to perform effective event log analysis. 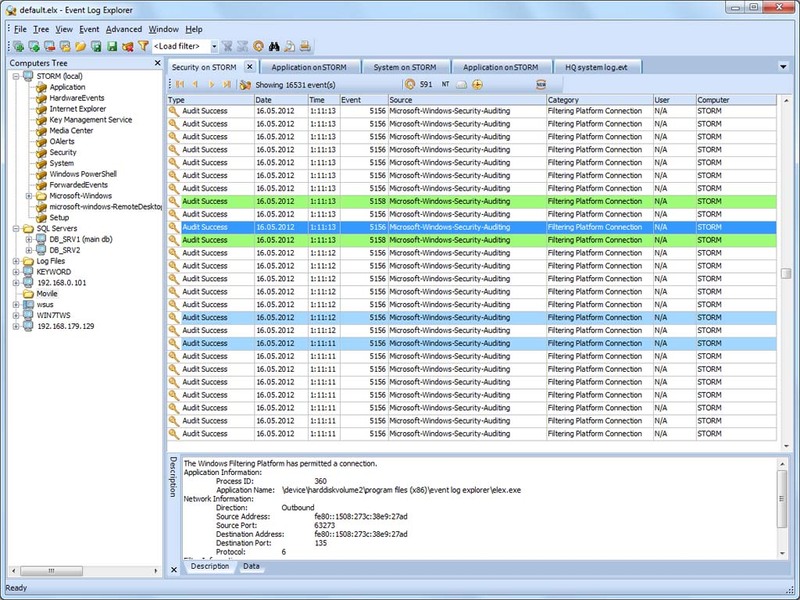 Event Log Explorer is a simple but powerful utility for monitoring, viewing and analyzing events in the Security, System, Application and other Microsoft Windows logs. It extends standard Event Viewer functionality and brings a lot of new features. Feel free to download it right now - this program is FREE for personal use! Statement: First, please download the orginal installation package by clicking the download link. Of course you may also download it from the publisher's website. Using Event Log Explorer crack, key, patch, serial number, registration code, keygen is illegal. The download file hosted at publisher website. We do not provide any download link points to Rapidshare, Hotfile, Depositfiles, Mediafire, Filefactory, etc. or obtained from file sharing programs such as Limewire, Kazaa, Imesh, Ares, BearShare, BitTorrent, WinMX etc. Software piracy is theft. If you like Event Log Explorer please buy it.